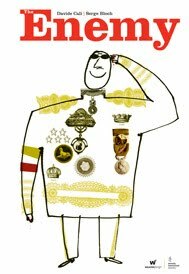 Described as All Quiet on the Western Front combined with The Little Prince, this extraordinary book by Swiss writer Cali was a major hit in France, and has been published in Australia by Wilkins Farago, in association with Amnesty International Australia. Using deliciously simple, childlike, textured illustrations that layer sketches with photographic elements, the book follows two opposing soldiers, sitting in holes in the ground, waiting for the other to make a move. Told from one soldier’s point of view, it’s clear as the book progresses that this point of view could be identically mirrored by the other solider, hiding deftly in his hole with his beef jerky, his water supply, photos of loved ones and not much else. As the book moves through many days, weeks and months, it opens up the minds of the soldiers and pours fear, resentment and desperation in there – and through this we learn just how parallel these men are. They both have family, they both have the will to survive – they both have war manuals telling them how to best do away with the enemy. Only – the enemy maybe not be without us, maybe it’s also within. Could it be that we all have blood on our hands? Could it be that we all have the responsibility to reach out and create peace? A beautiful representation of the insanity of war and the fact that when it comes down to it, we are all just people, The Enemy is a gorgeously-styled, extraordinary book that will touch an adult heart and stretch open the heart of a child. A priceless tool for sowing the seed in the mind of little ones - to counteract the threat of war.